Oath and/or declaration of Libero Sauro, in support of Guiseppe [sic] (Joseph) Grittani, January 24, 1941, two pages. After his release, Sauro continued to help other Italian Canadian internees and their families. 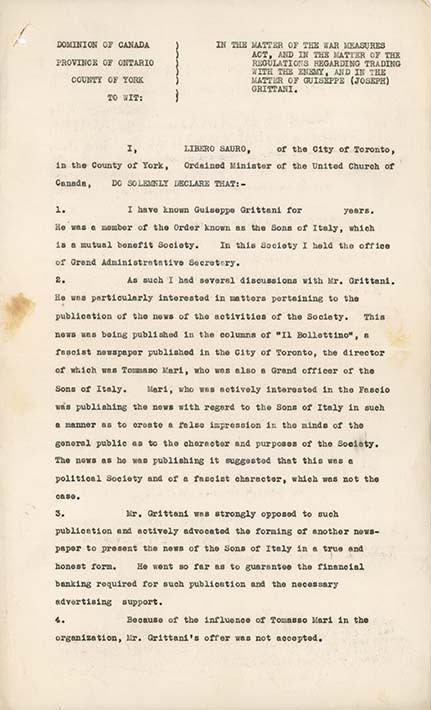 In this sworn declaration, he is testifying to the character of Joseph Grittani, whom he knows through his work with the Order Sons of Italy (OSI). He notes Grittani's displeasure with the way the OSI was being presented as a fascist organization in fascist newspapers. Grittani was interested in publishing a paper that would counter this perspective.